The Australian group is still flying high on their third album, but it falls far short of their previous success. In music, sometimes two wrongs can actually make a right, and there's perhaps no better example of this than Parkway Drive. The Australian quintet has taken the two most hated metal subgenres of this decade, metalcore and deathcore, and blended the two together, creating an entirely new and somehow unique engine of pure destruction. 2006's Killing With a Smile showed lots of promise, but it was 2007's Horizons that really cemented Parkway Drive as a worldwide force of devastation. Their music had most of the clichés of both subgenres, but when brought together with Winston McCall's primal screams, the result was unlike anything heard on either side of the line. It was too heavy and breakdown-intensive to be metalcore, but at the same time, too melodic and well-structured to be deathcore. However, these positives may have set too high of a standard for Parkway Drive's newest album, Deep Blue, which sees the band moving backwards rather than forward. Deep Blue is by no means a bad album. The band is in good form with their musicianship, maintaining the razor-sharp precision that they have shown on prior releases. McCall is still the beast he has always been on the microphone, roaring his vocals like a lion in bloodlust. Ben Gordon lives up to his reputation as one of the fastest, most exact drummers in the scene, holding time perfectly and diversifying his fills very creatively. Guest appearances by Brett Gurewitz of Bad Religion and Marshall Lichtenwaldt of the Warriors are welcome additions to the songs "Home is for the Heartless" and "Hollow", respectively. The area where Deep Blue falls flat is in compositional diversity. For a band that became popular because of their ability to mix genres, this album has surprisingly few diverse touches in it. Parkway Drive used to evenly walk the line between metalcore and deathcore, but most of the songs on this album have more deathcore elements while leaving out most of the metalcore parts. Where Horizons had a fairly even split between the number of breakdowns and the number of guitar solos on the album, Deep Blue has almost no guitar solos whatsoever and is laced with breakdowns from beginning to end. The album's first half suffers greatly from this, as the breakdowns create a choppy, inconsistent tempo that feels unnatural. The second half is slightly better and more consistent, but it still can't match the perfect, even flow of Horizons. 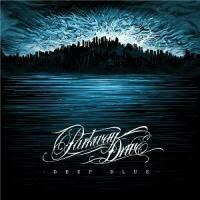 Deep Blue keeps Parkway Drive between genres, but only just barely. The lack of variety in the compositions is a serious issue for a band that had a much wider span of options on their older work. It is still a good album, and will likely bring in some fans from the deathcore crowd that may have previously found the band unappealing. Longtime fans of Parkway Drive know that they are capable of so much more, and the evidence that they've achieved more is undeniable. A return of super-producer Adam Dutkiewicz and their previously established sound would be advisable for Parkway Drive's next album, whenever they decide to start writing it.